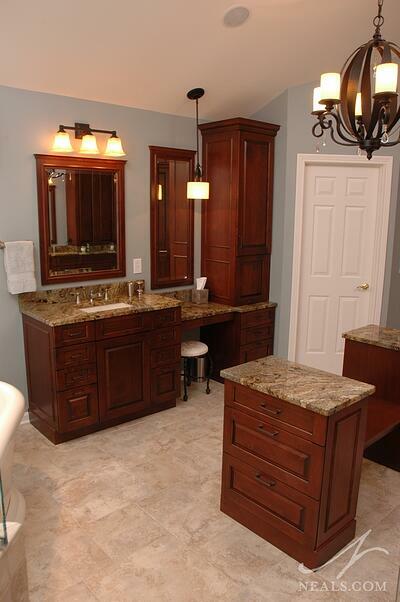 With more than enough room, this master bath had the potential to be a showpiece space with luxury to spare. Upon living in the home, however, the existing space did not live up to our client’s original expectations. With inexpensive and now out-of-date materials throughout, and a disregard for the scale of the room, the master bath was less than ideal as the dream bath the homeowners desired. The remodel’s goals were to reevaluate the space usage and floor plan, better integrate the larger scale of the room into the design, and inject updated style into the space with timeless material choices, better suited to the luxurious and elegant bath the room could be for our client. The original builder decor of this large master bath made the room feel cold and boring. Dated materials and finishes created a space the homeowners wished to get out of quickly, rather than to linger and relax. A large tub deck extended unnecessarily out along one wall, crowding the shower. 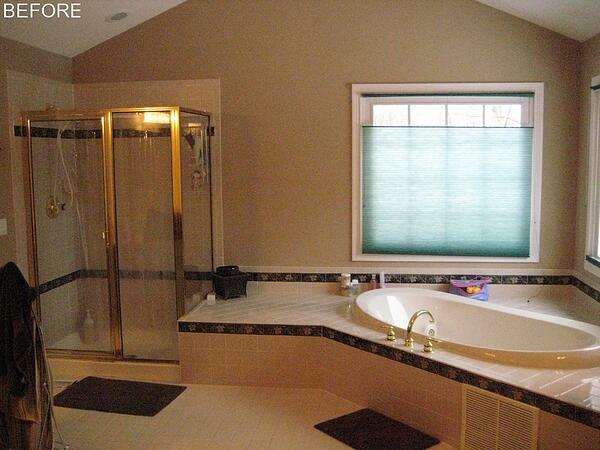 For the size of the room, the shower felt tiny to the homeowners, and looked more like an afterthought. The vent for the tub motor sat at the front of the deck, within plain site. White tiles on the tub deck and in the shower were difficult to keep clean. Entering from the master suite’s sitting area, the existing bath was likely intended to feel like an extension of the cozier space with a carpeted floor. The walls of the commode room and closet on either side of this entrance did not extend to the ceiling, creating ledges that were useless and impossible to clean. 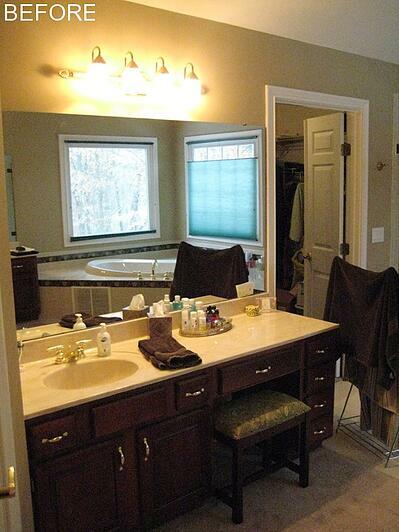 His and her vanities offered a lot of little drawers and cabinets, with little usable space. Plate glass mirrors and featureless sinks only added to the boring design. 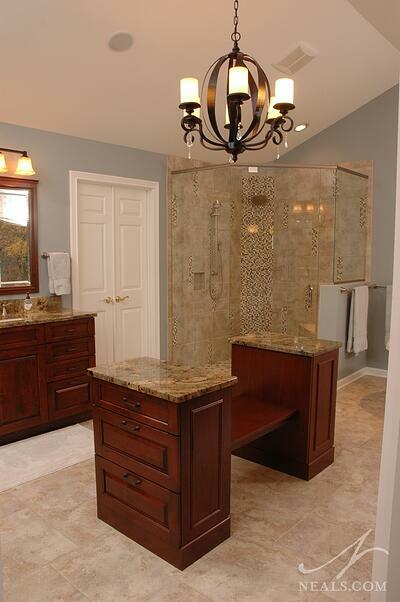 Create a timeless design master bath with materials and finishes that create a high end feel without being trendy. Utilize the scale of the room to create luxurious features while still preventing the room from feeling “too large and open”. Rework the space and materials to help the homeowners keep the space clean and tidy. Create better storage solutions to replace the closet and ineffective vanity cabinetry. Improve the room’s mechanical systems. While not the only dramatic change within the remodeled space, the new free-standing tub creates a new focal point. A transitional design with a solid base, the tub is set at an angle. Both the design and placement work in tandem to allow a larger amount of space to be visually as well as spatially taken up without the cumbersome qualities of the previous deck. The corner is left feeling airy, but not wasted, as a result. 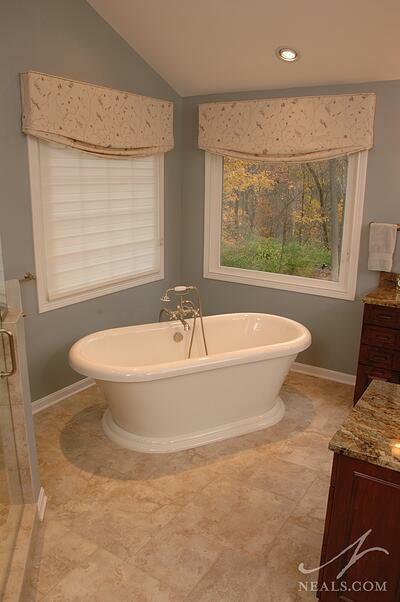 The angled bath also allows for a better view to the wooded lot while soaking. A satin nickel faucet and hand-held sprayer create a traditional accent in a go-with-everything finish. 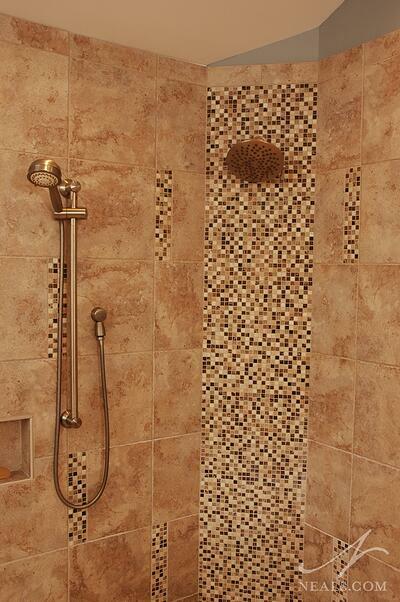 A new shower became another focal point in the space. In order to give the shower the attention it deserved, a door nearby was shifted a few inches down, allowing the angular shower both width and length in the corner. A half wall near the new tub offers space for a niche, bench and the shower valve, conveniently relocated near the entry. The rest of the enclosure is frameless. A playful mix of tile treatments, including glass mosaic accents, create contrast in the corner, once again helping to visually fill the space and help the eye distinguish the shower from the rest of the room. The hand held shower, which can use used while sitting on the bench, also makes quick work of post-shower cleanup. 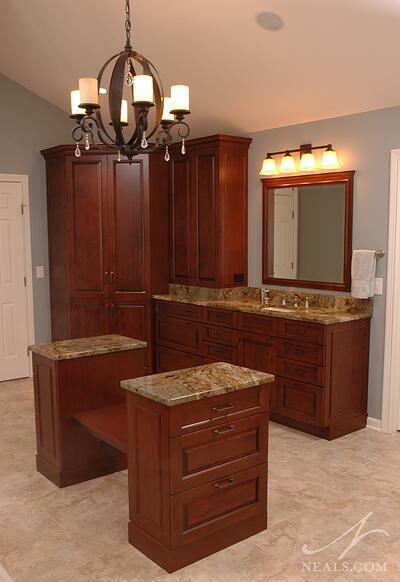 New cherry cabinets and granite countertops create a more sophisticated style statement than the original vanity. Drawers and cabinets, sized more appropriately for the items the homeowner needed to keep on hand at her sink, provide better storage. A tall linen cabinet in the corner creates a anchored column, helping the eye better understand the room’s scale by creating a context that extends above eye level. The adjacent walls of the commode room where extended to the vaulted ceiling, removing the dusty niche and creating a more distinctive transition between the two rooms. By removing the existing closet, a more custom storage solution could be installed utilizing cabinetry. Tall cabinets with pull-out shelves inside offer an organized system for bathroom and household items. Another element of the remodel that visually scales the room was to replace the old plate glass mirrors with smaller, beveled versions framed in cherry with matching crown trim. With fewer reflections throughout the room, the true size of the space can be admired without feeling lost within it. The new floor plan allowed for the installation of a bench in the center of the space. While this certainly provides a practical way of filling the room, it also injects more luxury into the space, making the bath feel high end. Cabinets on either side of the bench provide additional storage for the couple to share. With the larger floor space, a new flooring treatment was required. Large scale, naturally toned tiles are arranged in a pinwheel pattern across the floor. This treatment reduced the eye’s ability to see patterns or lines within the floor and makes the scale of the room less obvious in that respect. The final jewel of the new master bath is a revamped lighting scheme. Providing plenty of lighting over the tub and shower, as well as new lighting over the mirrors create a warm, well-lit space with plenty of task lighting. Taking advantage of the ceiling height, a new chandelier makes a clear statement of elegance. 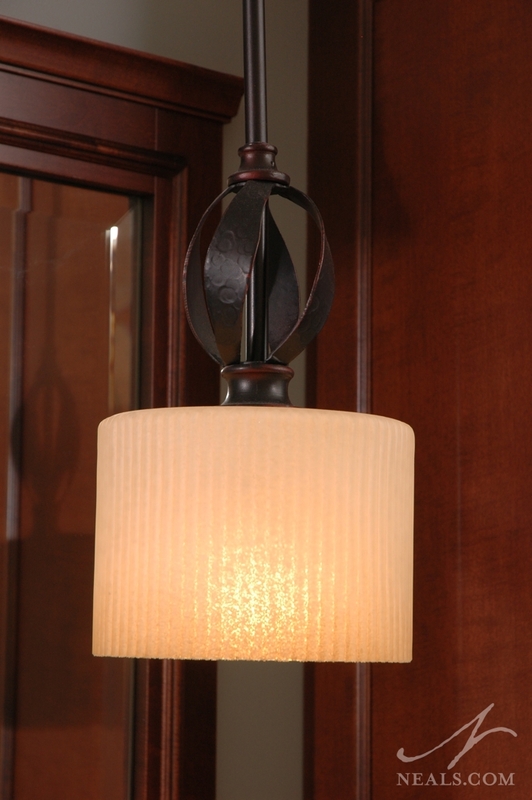 A mixture of lighting styles throughout are connected by their oil-rubbed bronze finish and scrollwork details. This eclectic collection provides points of interest throughout the room, helping the eye to see the entire space as vignettes, erasing all memory of the large, cold, boring cave it once was.